Your official tour guide will meet you at Kusadasi Cruise Port's Arrivals' Gate. ​You can see the Meeting Places pointed out on the picture. Euros / USDs are NOT Accepted. Terrain: Varying Terrain | Manual wheelchairs may require Assistance!! ⛳ So Called ‘Love House’|  5 mins. ♿-10ft. 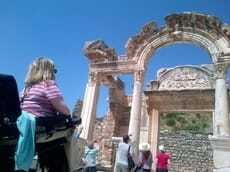 We offer personal private ephesus tours so the guide & the vehicle will be only for yourselves. You can Click Here to Find out more details about our Adapted Vehicles. 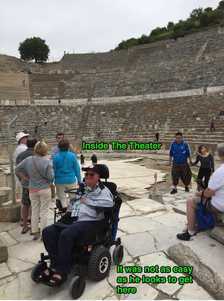 As Turkey Accessible Travel we provide wheelchair accessible vehicles and expert tour guides who know the best tracks in Ephesus for wheelchair users planning a tour of this amazing site. Condition: Is the traveler (s) Confined to Wheelchair? What is the width & lenght of the wheelchair(s)? What is the Height of the Wheelchair (s) with it's user in . What is the Weight of wheelchair with the user(s) in ? Q: How Long Does a Typical Ephesus Tour Last? Q: What is the distance from Our Cruise Ship to the Meeting Point with you and to the Van? A: The distance from your Cruise Ship to the Meeting Point with your Guide is 300ft. The distance from your Cruise Ship to Your Accessible Van is 1100 ft.
A: We use modern, clean air conditioned Wheelchair Accessible Minibuses equipped with Electric Lifts & Tie-downs. Q: How Long is the Drive from Kusadasi Cruise Port? Q: How much time do we spend at Ancient City of Ephesus? A:The time that we spend at Ephesus, depends on weather conditions, and the travelers' interest as well. Normally optimum time to spend at Ephesus is around 1 and a half hours. Q: Are there Accessible Restrooms at the Cruise Port & Other Places? Q: Do we have the guide & the vehicle private for only ourselves? A: Yes, this is your personal private ephesus tour so the guide & the vehicle will be only for yourselves. Q: Does the tour guide accompany us at the sites? ​A: The tour guide will be with you at all times and explain the history of each attractions that you visit. q: wıll there be someone to help us to push the wheelchaır? We can arrange a help for pushing the wheelchair if requested in advance while booking your tour. Otherwise your guide or drive will also be at your disposal in case of any needs. Q: will there be enough tıme for shoppıng? Q: What currency shall we bring with us for shopping in Turkey? A: Euros and USD and VISA/MASTER Credit Cards are accepted at all shops. Q: Where do you drop us off after the tour? A: You will be dropped off back at Kusadasi Harbour 1100ft. To the Cruise Ship. And only 2 minutes walking distance to the city center, and the market.